Gingham shirt and trousers by b store, made to measure jacket from j.a. daye, belt from Moustache, glasses by Bruno Chaussignand, document folder by Postalco and hand punched leather brogues by Joe Casely-Hayford for John Lewis. With the idea of an English gentleman abroad bouncing around my excited brain, I decided to breathe fresh life in to my holiday wardrobe and picked up two gingham pieces from b store to help me accomplish the desired aesthetic. My Summer ensembles tend to suffer the moment the eye gazes to the bottom half but I first saw a pair of trousers that could solve my problem at b store. Their 'Basil' gingham trousers are the ideal lightweight option for the warmer months. A week after solving my trouser predicament I ventured back to my favourite London store to cover the launch of their Summer "shop in shop" venture. Once inside I could not resist picking up the matching gingham shirt. Having gone all out gingham I just had to research the origins of this all too familiar and versatile fabric. Gingham fabric was first produced in the 17th century in England and shipped to the colonies. It was originally striped, but gradually came to be a checkered fabric. A popular colour combination for gingham has always been blue and white. There is however some disagreement about where the word gingham came from. Some argue that it is from the Italian "ging-gang," while others cite the Malaysian word "genggang." Still others argue that it stems from an Indonesian word. What all the possible roots have in common is that they all mean "striped." The fabric can be made using wool, silk, or linen or any synthetic fiber as well. Of course it is also possible to find "gingham" printed on oilcloth or vinyl for use as tablecloths.Currently, I just cannot get enough of it. A closer look at the details...Gingham shirt and trousers by b store, belt from Moustache and document folder by Postalco. 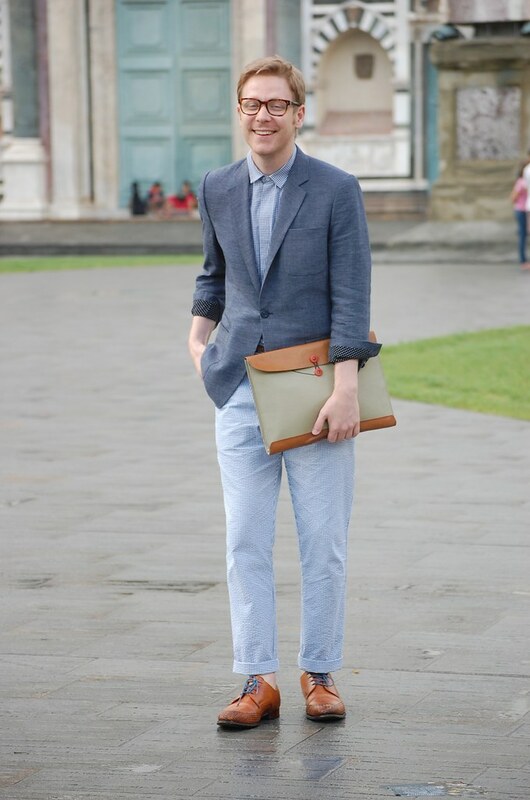 The eagle eyed amongst you might have noticed my inclusion on Tommy Ton snaps Pitti Uomo over on GQ (if not here I am and here is my bottom half). If you've been following Tommy's Pitti snaps you'll know just how many fabulously dressed men there are strutting down the paths of the trade show. Never in my wildest dreams did I think I would appear alongside such well dressed men. I'm nowhere near the level of most of them but I'll nevertheless savour the sartorial association. 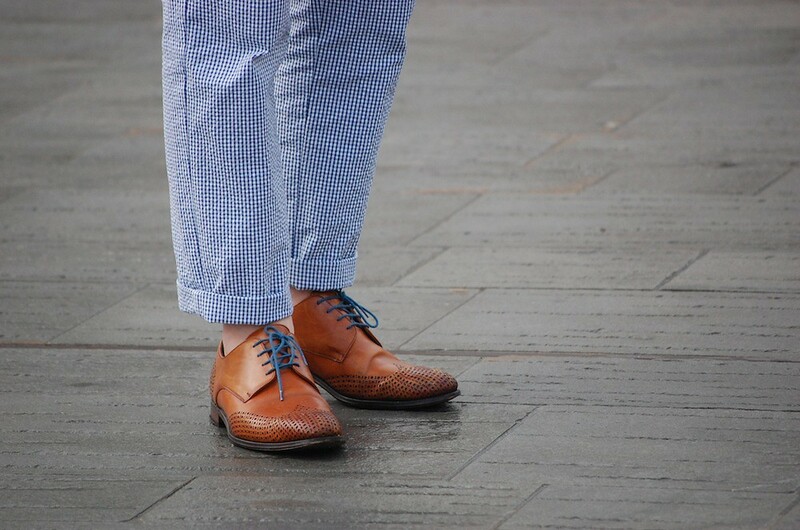 Gingham trousers by b store and hand punched leather brogues by Joe Casely-Hayford for John Lewis. Sounds like you've had a wonderful time! Matchy-matchy gingham = ridiculous! I love it! Kidding aside, I do love "the English gentleman abroad", the fact that you envision a character for yourself to guide your sartorial choices. I have one for myself and I think it's somewhere along the lines of "globetrotting deranged artist". It's an idea I think more people should adopt, to prevent them from wearing things just because it's in store or because that's what the magazines tell them to wear. no surprise tommy took your photo. gingham on gingham is quite tricky for me and you pulled it very well. LOOKING SO DAPPER STEVE! I LOVE IT. 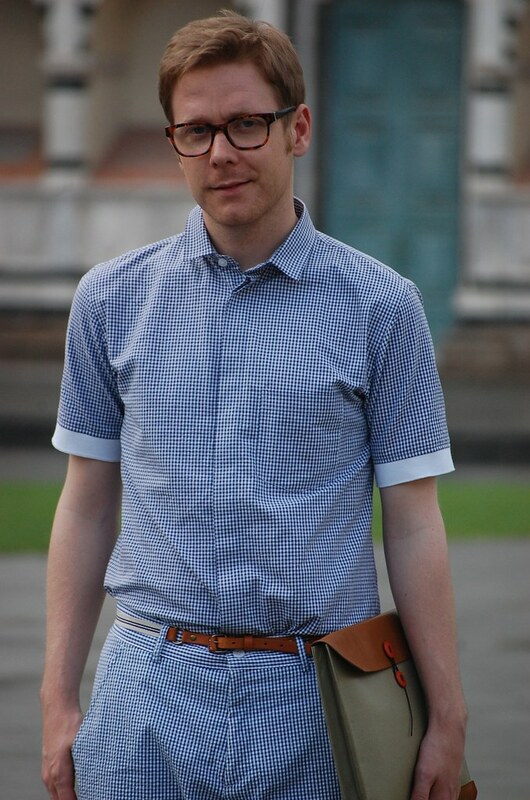 Gingham on gingham, brave man! I think it works well though, but I do prefer the look when you've got your jacket on (that's just me though). 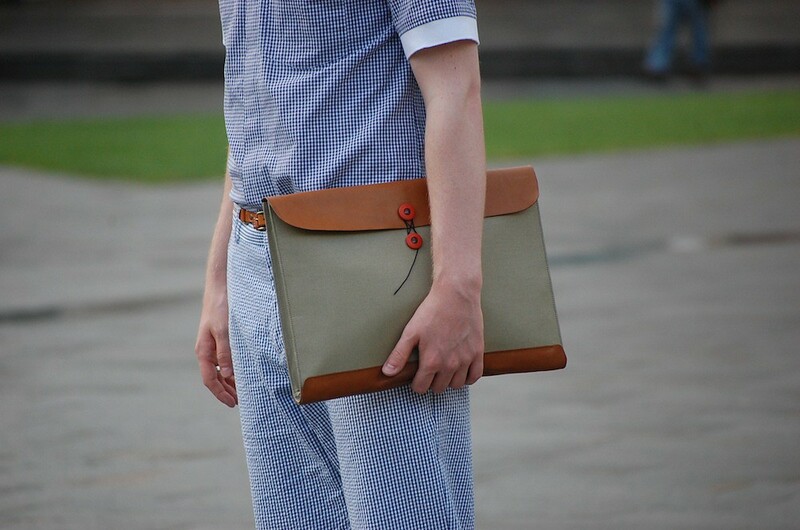 Oh and nice contrasting with the shoes, belt, glasses and folder - it all comes together really well. EJ here- if you don't have the balls to leave comments under your own name, then don't leave them.